These communication boxes are popping up in a neighborhood near you, just like this one in a suburban parking lot. In the battle to shorten the “last mile” of copper wiring to your wire line phone, telephone companies are putting more of these small remote terminals close to you, in place of larger terminals or central offices further away. They contain all the electronics necessary for linking twisted copper pairs to fiber optics. Since they reside outdoors, they must endure the elements, including having an operating temperature specification from -40oC to +55oC. One of Keysight’s customers is an electronic designer for these remote terminals, amongst many other product lines that he is also responsible for. Often, he has to set up verification tests for these terminals in their operating setting. One common requirement would be testing with the door(s) closed. 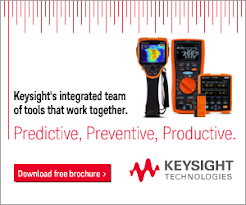 Keysight’s Remote Link solution is ideally suited for this type of testing. Using Bluetooth communication to his Android tablet, our engineer is able to track at his desk testing data coming from inside the closed terminal box. Like all Keysight handheld multimeter, the U1272A he uses has an IR port in the back, besides the usual LCD display in front. The IR to Bluetooth adaptor, U1177A, snapped over the IR port converts the IR link into wireless RF signal. Our engineer received the RF signal on his Android Bluetooth port. He even has a choice of two different free apps to manage and process the measurement information. The Mobile Meter app captures and displays up to three live meters on screen. The more complex Mobile Logger app further logs all three meter readings over time and presents the results in either graphical or numeric format. The entire process takes only a few clicks to set up. See a YouTube demo video here.